This article originally appeared in Past Horizons dated May 14, 2012. As it is no longer on that website, I have posted a copy here. During the late Iron-Age, Lofoten chiefdoms were actively increasing their wealth through tribute and trade. These chieftains owned large farms, built fine boats and longhouses, and surrounded themselves with exotic items brought back from trading expeditions. 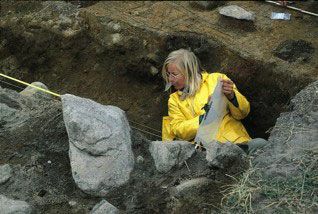 A glimpse into this dynamic Norwegian world was helped by a chance discovery in 1981 on the Island of Vestvågøy which contained the largest longhouse ever found in Scandinavia. The results from the excavation led to such a wealth of information that a replica of the hall was built nearby allowing visitors to experience the life of a Lofoten chieftain. It is estimated that there may have been three Lofoten chiefdoms; two of them on Vestvågøy and the third on the neighbouring Island of Gimsøy. This way of life was already established by the early centuries AD, with fishing and small-scale farming the main subsistence activities. However, towards the late Iron Age larger farms with a more centralised function began to appear, indicating a shift in fortunes and a concentration of power. At that point the Lofoten islands were densely populated putting pressure on the scarce arable land found mainly along the coastal areas. Borg, located in the northeast of Vestvågøy, still forms one of these habitable spots. This tiny community had been identified by archaeologists as exhibiting most of the hallmarks of a possible chieftain’s farm with its boathouse remains, barrows and vestiges of long-houses. However, with no evidence of a great hall there was no conclusive proof. This was set to change when, in the Autumn of 1981, Frikk Harald Bjerkli, a local farmer out ploughing his land, noticed some unusual pottery and glass coming up in the soil. Fortunately, he retrieved the items which proved to be a turning point for Borg history. The fragments represented high status European wares, rarely seen in Scandinavia let alone in Northern Norway. In response to this discovery test trenching began in the farmer’s field in 1983 and recovered more of the distinctive Rhineland pottery known as Tating ware, along with a wide variety of European glass fragments. In the same location the remains of at least five buildings were identified with radiocarbon dating indicating a span of 650 years, leaning towards late Iron Age. However, the range of artefacts found, including the imported wares, were mainly dated to between the 6th and 8th centuries. The exciting results obtained from the test trenching clearly warranted more action. Major excavations got underway in 1986 in the form of a combined research project involving participation from Norway, Sweden, Denmark, Finland and the United Kingdom. After three years the archaeological team had succeeded in excavating the remains of the largest longhouse ever found in Scandinavia, and was interpreted as a chieftain’s hall. The excavations revealed that a 67-metre-long building had first been erected as early as the sixth century and was subsequently rebuilt and enlarged at the beginning of the 8th century to a length of 83 metres. The remains of the hall itself were preserved to the extent that traces of the turf outer walls, entrances, partitioning walls, floors, hearths and internal roof supports could be understood. The structure had been divided into five main areas consisting of the living quarters, banqueting hall and storage room, vestibule, and animal shed. The function of each room was determined mainly by the distribution of finds. Although modern farming methods had destroyed the stratigraphical sequence the objects did not appear to have migrated very far from their original locations within the confines of the building itself. After three years, archaeologists had amassed enough evidence to re-construct the long-house as it would have looked in its final phase. Several alternative roof constructions were discussed based around the two options of shingle or turf. Shingle, such as is found, for instance, on Norwegian stave churches, was eventually decided upon. Shingle makes the building visible from a great distance, whereas a turf roof would have made the hall quite inconspicuous within the landscape. Poles mounted in pairs bear the weight of the roof which sits 9 metres from ground level and relieves the turf outer walls of any strain. The long-house was completed in 1995 and is now known as the Lofotr Museum. At this time, boat building had become much more accomplished and navigation was extremely precise. A warming climate also meant that travelling became easier and the Atlantic Ocean was crossed on trips to Iceland, Greenland and Vinland (part of North America). Norwegian merchants travelled to the east, by way of the Russian rivers, to the Caspian Sea and through the Black Sea to Constantinople (Byzantium). 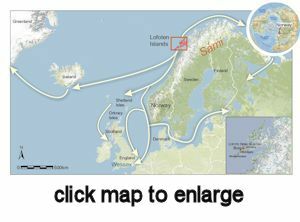 One Norwegian chieftain from the 9th century who went on such expeditions was Ottar from Hålogaland, to the north of Lofoten. In his travelogue from the 9th century he describes travelling to the frozen wastelands along the White Sea, dealing with groups such as the Sami, then onto the trading towns of southern Scandinavia and across to England where he visited King Alfred of Wessex. Ottar brought back to his homeland luxury articles such as fine textiles, glass vessels, precious metals, wheat, honey and wine. In return he could offer black fox and white marten fur, soapstone vessels, whetstones made of shale, and a variety of iron goods. Walrus tusk ivory was very much in demand and so valuable that when Ottar visited the Court in Wessex he brought two as a gift to King Alfred. Ottar may have seemed particularly adventurous to the likes of the English, but due to the limitations of the land in supplying their needs it was expected of men from these Norwegian communities to travel in search of wealth and opportunity. This, of course, meant leaving behind a family and slaves to continue the year-round farming activities. Life on an Iron Age farm involved a strict demarcation of roles. The women were responsible for milking the cows, baking the bread, brewing beer, preparing meals, spinning, weaving and raising the children. When young, boys and girls had a similar upbringing. They played together and were expected to take part in day-to-day chores where they acquired the skills needed to run a successful farm and maintain the community; to keep the society going. The women went straight from childhood to marriage and were equipped with a personal dowry. This was their first contribution to the wealth of the farm to which they moved, and in many ways a woman was as valued and respected as a man. She might own her own land, and with very few exceptions would inherit on an equal footing with a man. To symbolise her authority and power, she would wear the keys to chests, cupboards and storerooms on her belt. In certain situations she would take over the functions of her husband and was often effectively in charge of the farm. At the age of 15, young men were entitled to decide how to use their inherited property and to bear responsibility for their actions. 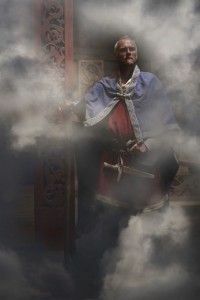 They were given public tasks that included participation in defence and acts of vengeance, and were expected to win honour and wealth for themselves and their families. Although these people seemed to enjoy status and wealth, events or circumstance appeared to have driven them from their settlements. Iceland was fast becoming a popular destination for Norwegians, being first settled around the late 9th century by a chieftain called Ingólfur Arnarson. Many chieftains quickly followed suit, accompanied by their families and slaves, most probably driven by political upheaval and land pressures. Towards the end of the 10th century the farm and long-house at Borg were abandoned. The precise reasons for his departure from the shores of Lofoten may never be known, but it is likely that this chieftain, in search of more security and better opportunities, had boarded his ship and in the traditional Norwegian way sought greater fortunes overseas.